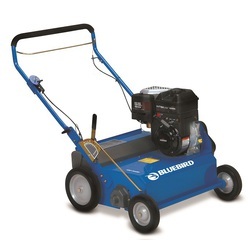 -The Bluebird S22 Seeder makes turf renovation simple and easy. The S22 is well balanced and portable thanks to the placement of the polymer seed hopper and its folding handle. The seed gate is also adjustable to accommodate a broad range of grass seed. -Replacement Delta Blade Reel:The 12-gauge austempered steel delta blades have a unique angled position and beveled cutting edges that cut slits in the ground for dethatching, overseeding or aerating slopes and terraces. Ideal for thinning running-stem grasses like Bermuda and St. Augustine. -Adjustable Handle: Every Bluebird power rake and seeder has an adjustable handle allowing for three different operator heights as well as folding for easy transportation and storage.